Why are you wearing Chinese clothes? Um... uh... you don't look very Chinese. What? Do you think we're all yellow? And surprisingly often, the other person will then accept that I am actually Chinese; sometimes out of confusion, other times for fear of exhibiting racist behaviour and often just because it sounds so stupid it must be true. There are many reasons why I'm obviously not Chinese - I'm white (they are all yellow), I have a British accent and, most damningly of all, I wear Chinese clothes. This may sound odd, but Chinese people do not wear Chinese clothes. Just think about it for a minute. When is the last time you ever saw any Chinese people wearing non-Western clothing? It's only ever characters in films or perhaps staff at a restaurant. You simply never see normal people wearing traditional clothing. And that's a terrible shame. With at least 5,000 years of history and many dynasties (each tending to have a completely different style of clothes) there are thousands of different styles of Chinese clothes - many of them beautiful and elaborate. I find it simply awful that jeans and t-shirts have supplanted them all. Even on formal occasions or in business situations, Chinese people go with Western suits. Japan has always been more at ease with its traditional culture which I feel is because they compartmentalise it: the ancient sits alongside the modern, but separate from it. Whereas in China, there is no boundary between the two. So in Japan, there are various formal occasions throughout the year when kimono are worn and that sits happily and easily within Japanese culture. Not so in China. 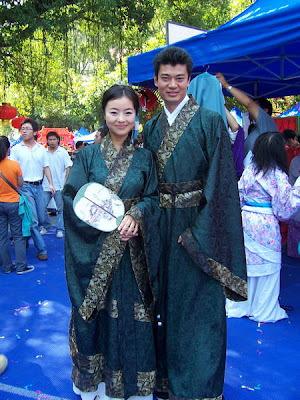 Recently there has been a movement in China to popularise Hanfu - Han dynasty clothing. In fact, the Japanese kimono is also known as gofuku which means "clothes of Wu" - a Chinese kingdom - as the kimono is modelled after Han dynasty clothing. My pedantic, nationalistic wife is very keen to point out that a lot of what we perceive as traditional Japanese culture is copied from or influenced by the Chinese. Well, whatever the origins, the idea that Chinese people ought to be able to wear their traditional clothing in the same way that the Japanese do is gaining traction in China today. There are a few problems though. Many foreigners tend to think of traditional Chinese clothing as being the qipao and cheongsam. Unfortunately, cheonsam are relatively recent and qipao are from the Qing dynasty. The Qing dynasty was when the Manchu (from Manchuria) took over China and was the last of the Chinese imperial dynasties. They were (and still are) widely hated. What less obvious is that the qipao and cheongsam are developments of the same thing - one is just a righter, more tailored form of the other. It gets extremely complicated after that and I could easily fill several pages on the history of them. But if traditional Chinese clothing is to worn, then why Han dynasty and not clothing from another dynasty? And is it still relevant? When one looks at Western cultures, national costumes and formal clothing tend to be a bit more recent. And just when would it be worn? Some advocates of the hanfu revival now wear them to business meetings in place of suits, others keep them for occasions like weddings and festivals. It's a bit of an odd issue with many problems to resolve, but then they are trying to invent a new tradition. I like Chinese clothes (I like Japanese clothes too, but don't tell the wife) and I think it's a terrible shame that they've been abandoned and so quickly too. When Japan and Korea have managed to retain their own traditional dress it's a pity that China hasn't. So hopefully the hanfu movement will prove successful and we'll see Chinese people actually wearing their own clothes. I never knew the Chinese hated any of their dynasties. I always thought they claimed anyone who conquered them was already Chinese so it was more an internal revolution and they are always proud of anything Chinese (as being far superior than anything else anywhere else). I got this from Western-authored books, mind, not from the dragon's mouth. Yeah, I find it pretty weird too. They regard the Manchurians/Manchu as "foreigners" despite them clearly coming from the top right of China. They did come from outside the Great Wall, so I suppose that might have something to do with it, but you don't hear them talking about the Mongols in the same way. I'm definitely going to have to do a bunch of reading in this area. PS Love your turn of phrase. 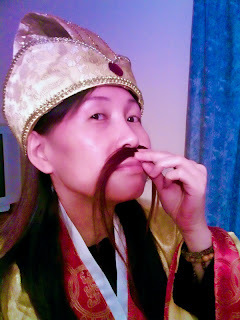 "I really hate the manchus alot!!!! I do not see why the Chinese government﻿ have not taken actions in ethnically cleansing them from Inner China!!!" Han Chinese attitudes to the Manchus were a bit screwed up. I believe foot-binding, that most repulsive of Manchu-era practices, developed in the Han upper classes as part of a general inturning of everyday culture after the Manchu takeover, as it (literally) hobbled the women's ability to move around outside the home. The Qing imposition of the Manchu queue (that shaved front, ponytailed back, hairstyle that is so familiar from Western representations of the inscrutable Oriental) was particularly hated, so its no surprise their clothing tastes aren't the subject of nostalgic yearning either. In Japan, however, this break in continuity isn't present so it's fine to fetishise samurai style. Interestingly, when the Japanese were engaged in pell-mell modernisation after the Meiji revolution, some of the old ways that were being discarded - such as the neo-Confucian fourfold stratification of the social system - were characterised as Chinese importations and therefore not a real loss. Nice Post and also nice pics of Chinese clothes, I really like Chinese Dressing style.